Choose any options (i.e. date, venue) from the dropdown menu(s). If there are ticketing options, the price shown is added to the base price. Enter desired quantity. Click on Add to Cart. Repeat to add additional tickets of different types. When you’re ready to pay, click on the Shopping Cart button at the top of this page, you can add/remove or change item quantities directly in the cart. and proceed to PayPal to pay securely online with your credit card (or PayPal account if you have one; it is not required). Please note that the option to pay by cheque does not apply to online ticket sales (you can pay by cheque at the door for most events or by mail if the timeline allows). You will receive email confirmation of your purchase. Please print it and bring to event as proof of ticket purchase. Thanks for coming by the Buy Tickets page and contact us if you have any questions! 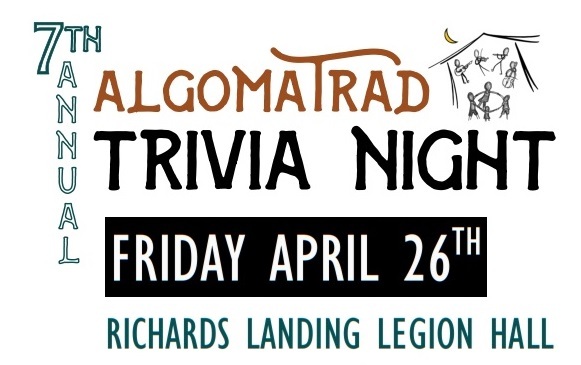 7th Annual AlgomaTrad Trivia Night FUNdraiser, Friday, April 26, doors open at 6:45pm, starts at 7:30pm sharp. Online purchase of tickets for the AlgomaTrad Trivia Night FUNdraiser. You can purchase either a table or a single or multiple tickets. If purchasing more than one ticket, but not a table, add the number to your cart. You can edit your selections in the shopping cart before completing your purchase. Click on "Shopping Cart" at the bottom of this page or the Shopping Cart Icon at the top of the page.